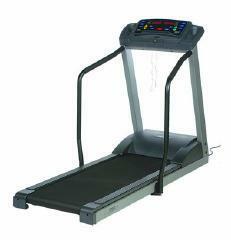 The Trimline T360 treadmill is probably the best Trimline treadmill in the market today. But it is priced above $2,000 so I don’t think a lot of people can afford it. If a high quality treadmill with lots of features is what you’re looking for, then this treadmill is your perfect choice. However, due to its high price tag, be sure that it fits your budget before deciding to buy. This treadmill offers a bigger and more powerful motor than other Trimlines. It boasts a 2.7 HP continuous duty US made drive motor that can reach up to 11 mph and 12% incline. It comes with 6 preset and 2 custom programs to give you more variety in your workouts. You could also use the heart rate chest strap (included to this unit for no extra charge) to workout in your target heart rate zone. The Walk, Jog, Run speed quick keys as well as the Hill, Mountain Pass, Peak elevation quick keys can be customized to meet your needs. This feature is perfect for those who use interval training in their workouts. It allows you to change your speed and/or incline with a simple push of a button. The 2 window 1”LED display shows your time, speed, distance, incline, calories, pace, and heart rate just to name a few. It allows for easy viewing of important information. The 20" x 57" reversible phenolic deck surface features an orthopedic belt. This belt is softer than ordinary belts, but the problem with it is that is causes more wear and tear to your machine. But the good news is that Trimline provides excellent warranty so you don’t have to worry about repair costs. This Trimline model has a 30 year frame and drive motor warranty, 2 year parts warranty, and a 1 year labor warranty. These warranties are some of the best in any price range. The biggest weakness of this unit is its price. It is priced above $2,000 so many won’t be able to buy it. Also, the ortho belt may also cause some problems in the future but that is unlikely since this machine is of high quality. Besides, the warranty will take care of any repair expenses when needed. I do recommend the Trimline T360 treadmill. Although it is a bit expensive, I still think that you’ll get great value for your money. If you plan on buying a Trimline T360 treadmill, I suggest you buy it at amazon. You can get it for just $2,398.00.